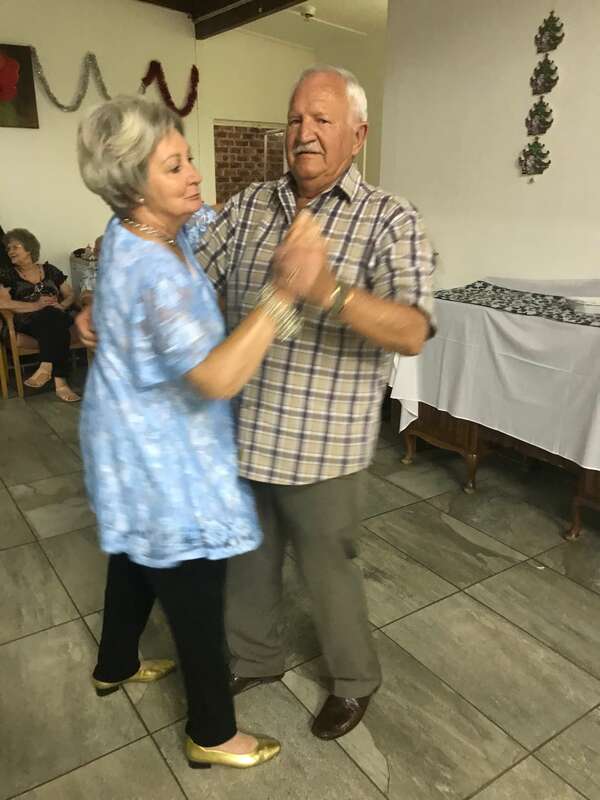 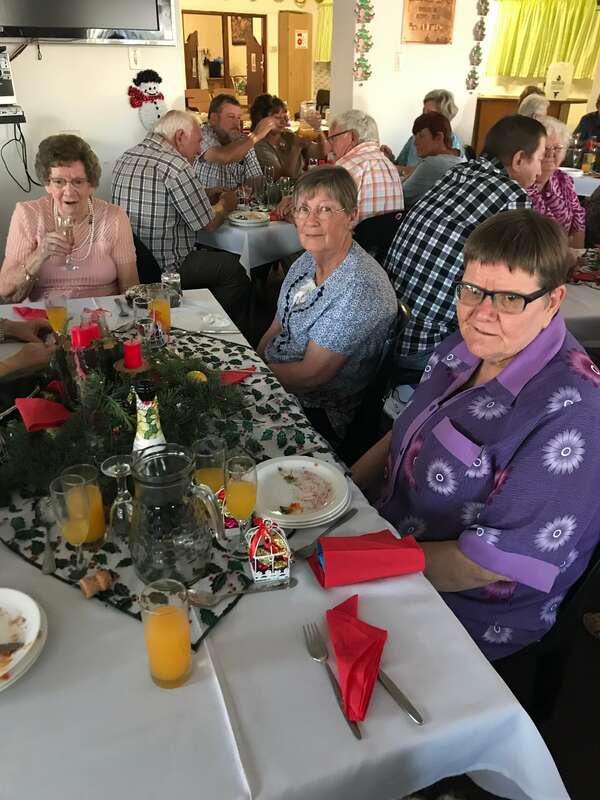 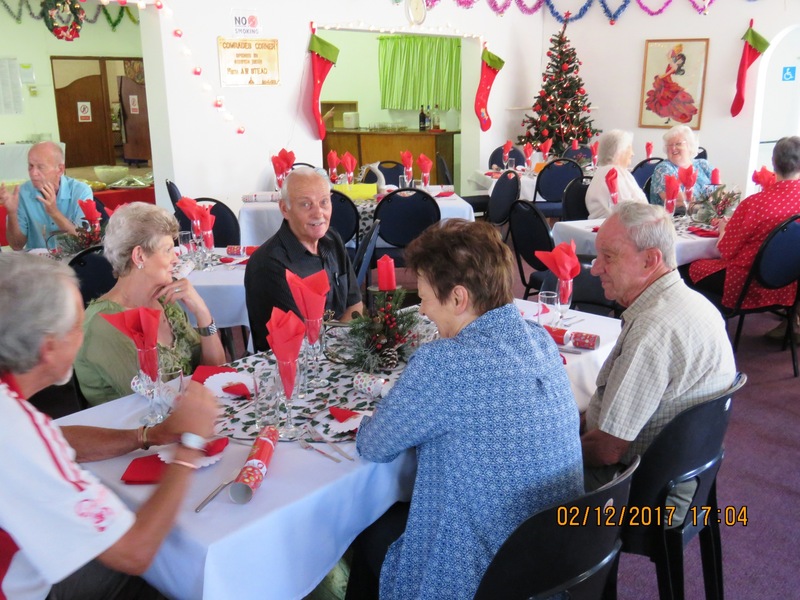 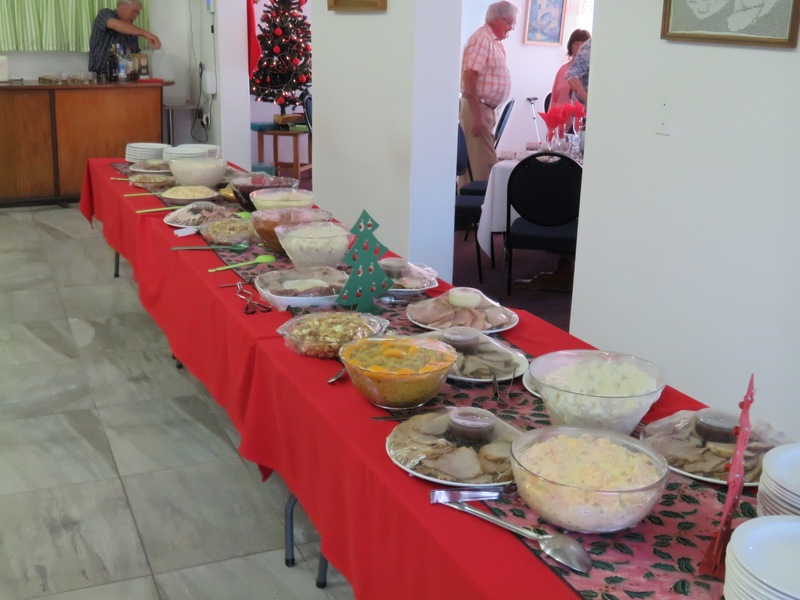 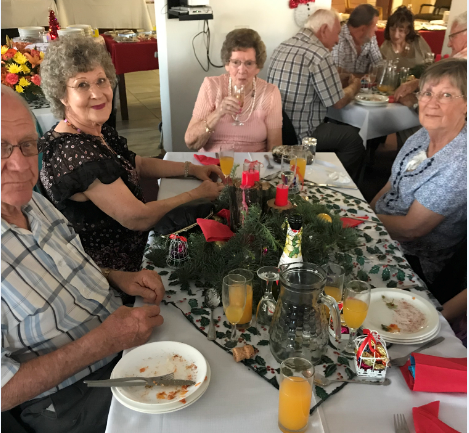 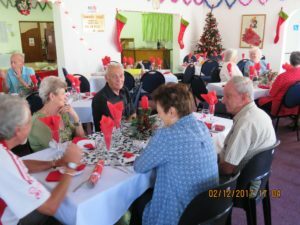 Once again the residents were well entertained and kept busy over the festive period with many activities arranged by the committee and members of the community. The fun started on Saturday 1 December with the annual Christmas Party. 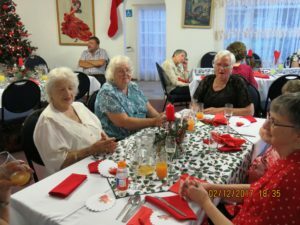 As usual Bettie, Sheila, Elize and the kitchen staff provided a scrumptious buffet dinner followed by an assortment of puddings to kill for. 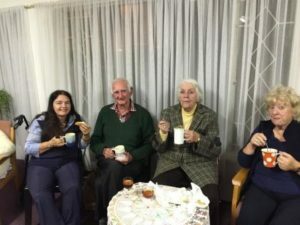 The liquid refreshments were readily available for members to lubricate their joints. 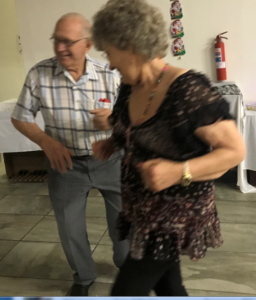 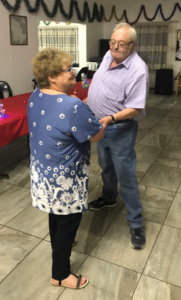 After the meal the residents relaxed to enjoy a wide range of music presented by Stanley White, however, the good music encouraged the residents and guests to get onto the floor and dance until the late hours. 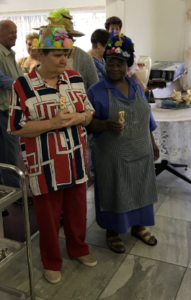 Members of the Lewende Woord Kerk arranged a an afternoon of Christmas Songs and delivered little bags of blessing for the residents. Bev and Anabel once again entertained everyone to their repertoire of old songs. 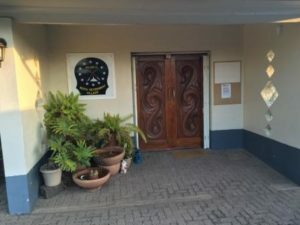 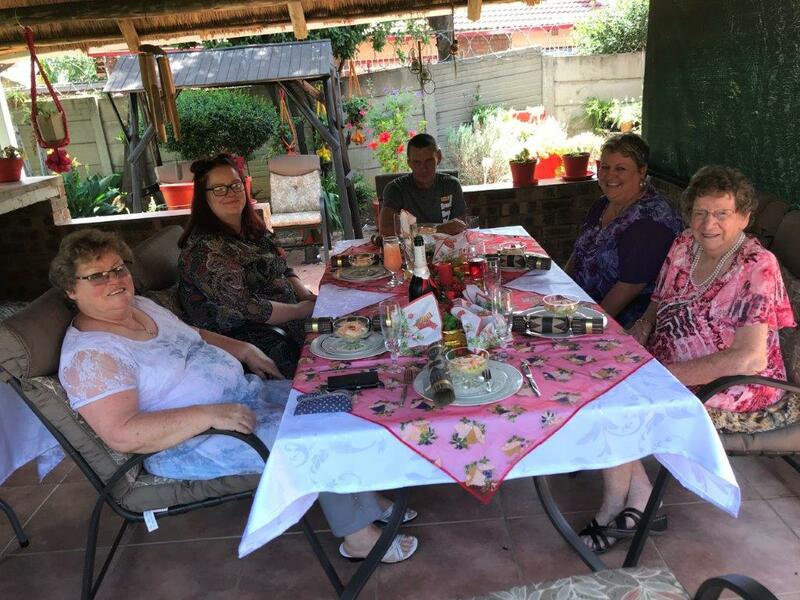 This year the committee arranged and attended a lunchtime Braai with all the staff as a token of appreciation for their efforts towards the smooth functioning of the cottages. 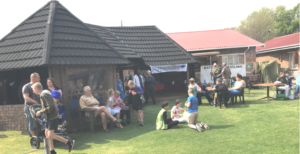 As you walked down Rhodes Street on Saturday 8 September the aroma of meat simmering on the braai, Prega rolls, curry and rice as well as other delicious foods and goodies drifted across drifted through the air together with the strains of popular music from the mobile studio of Radio Kragbron coming from the Vintage Fair being held at the Moth Cottages. Throughout the morning a steady stream of people strolled through the gates to support the Moths and enjoy the gastronomic delights that were available as well as all the other bargains that were available. 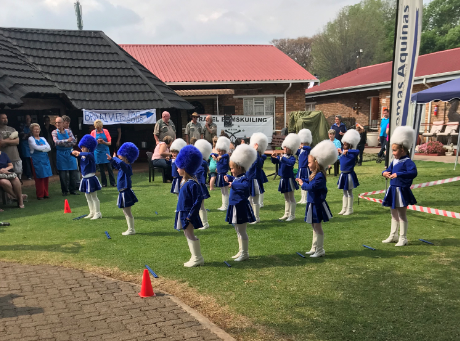 The visitors were also treated to the relaxing and snappy Miranda music provided by the Saint Thomas Aquinas School Miranda Band, this was followed by a display by the Kiellie Kranke drum majorettes that mesmerised their audience. 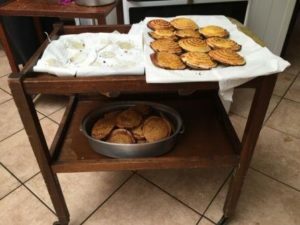 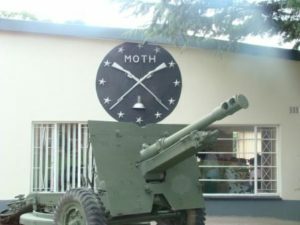 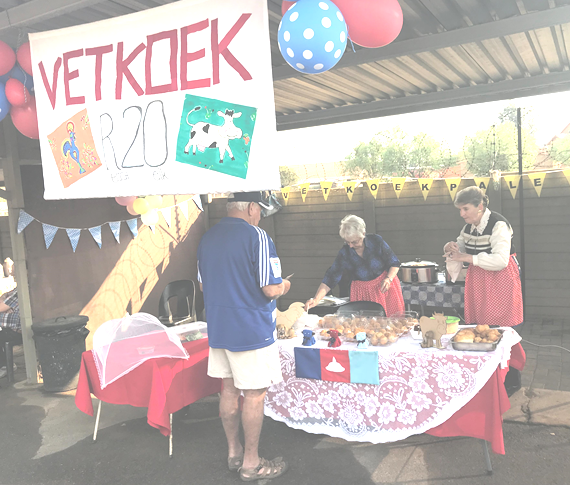 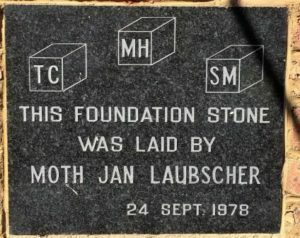 The fair was held to raise funds to assist the Moths to provide quality accommodation to their residents at an affordable cost. 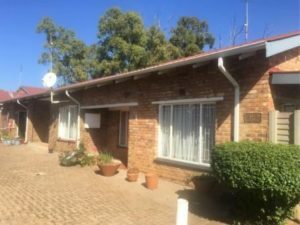 They currently accommodate seventy four residents in sixty three units. 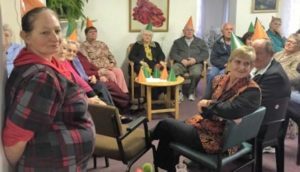 A number of these residents only receive government pensions. 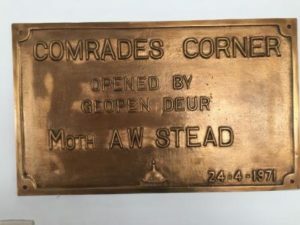 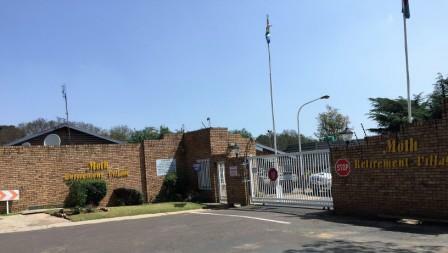 Currently the Moths are raising funds to install a backup water supply system to ensure that residents have sufficient water during the frequent interruptions that Witbank experiences in its water supply. 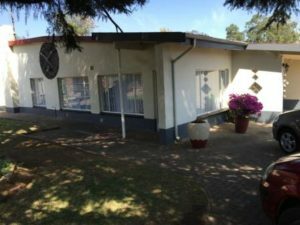 The complex does not receive any form of subsidy from government and is dependent on self-generated funds. 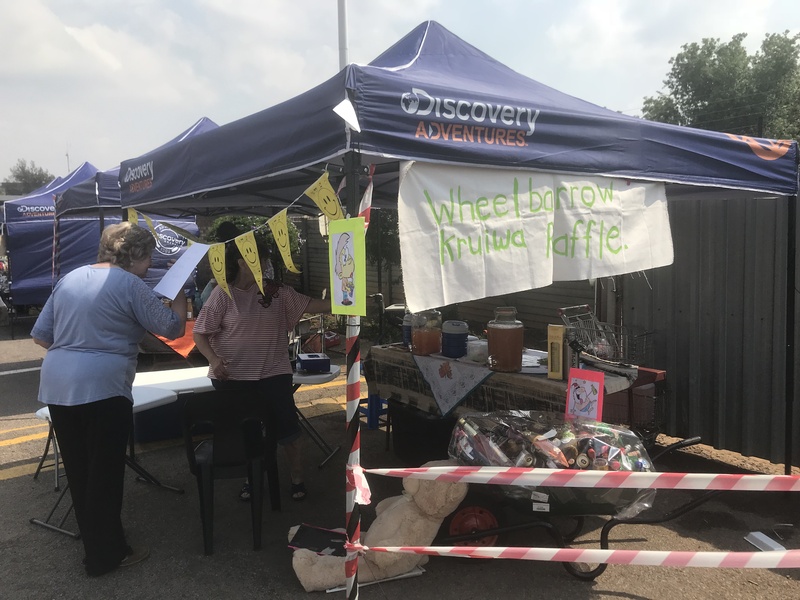 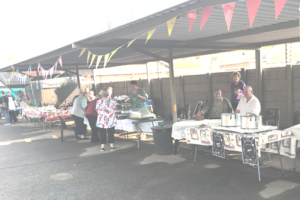 The fair convenor Clive Hatch expressed his satisfaction with the support received from the public and he extended his thanks to everyone who supported the day with donations, hiring of stalls and purchasing of goods. 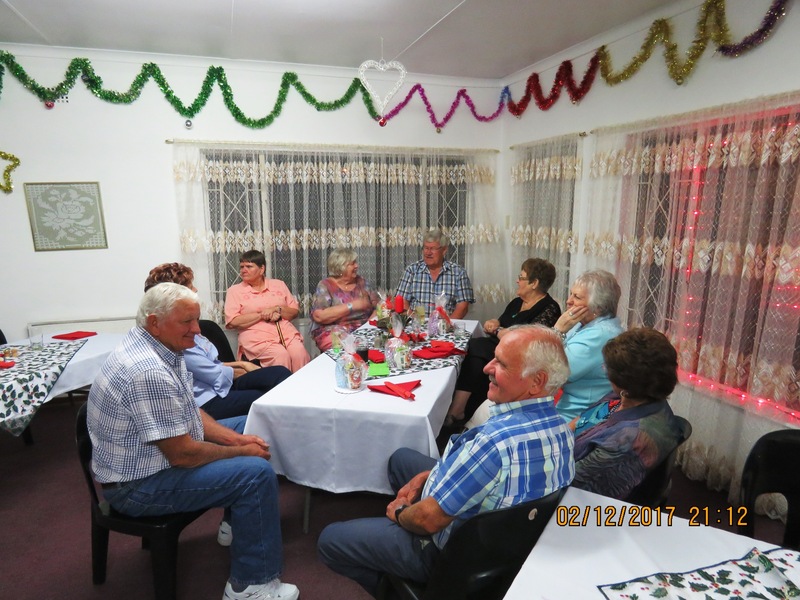 He gave the undertaking that all funds will be used to improve the lives of the Moth Cottages residents. 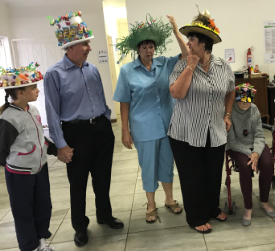 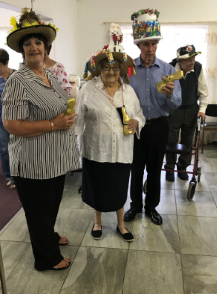 The residents at the MOTH Sound Memory Cottages gathered in the lounge on Easter Sunday to display their handiwork and skill in creating a colourful and stunning Easter Bonnet. Nobody was disappointed over twenty stunning and colourful hats were on display. 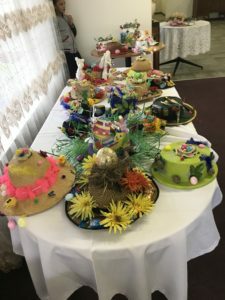 Because of the high standard of entrants the judges decided not to recognise a sing hat as the best hat but to rather present equal prises to the top three hats. 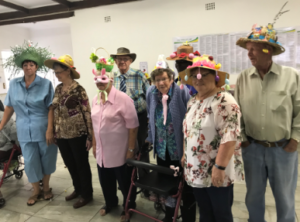 The ‘parade’ was followed by a delicious Easter lunch. 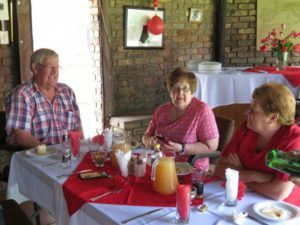 Valentine’s Day was celebrated with a community braai at the lapa and front lawn of the cottages on Wednesday 14 February. 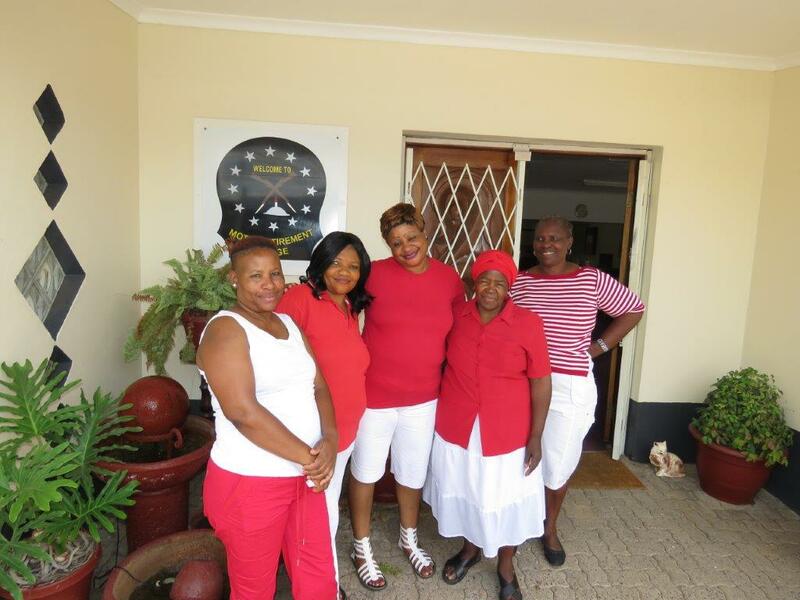 Many of the residents as well as the staff joined in the spirit of the occasion by wearing red and white. 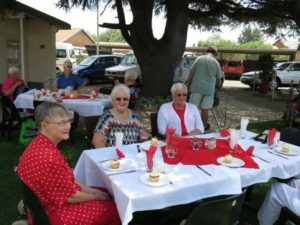 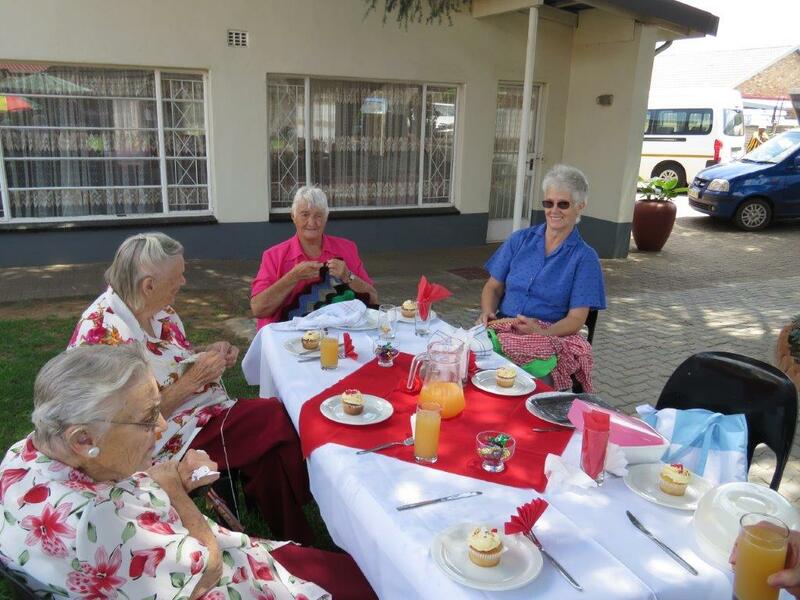 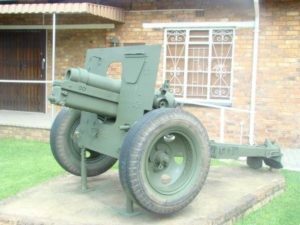 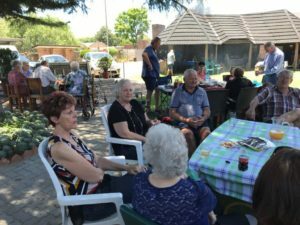 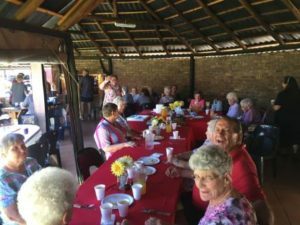 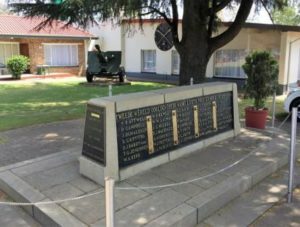 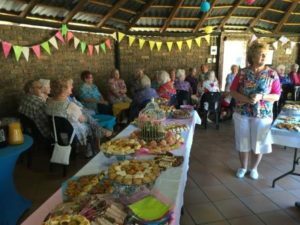 The residents of the Witbank Sound Memory Cottages got together around the Lapa on the front lawn to celebrate the start of the new year. 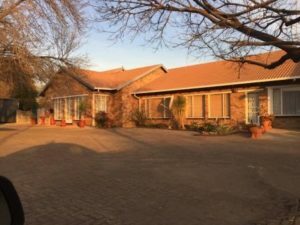 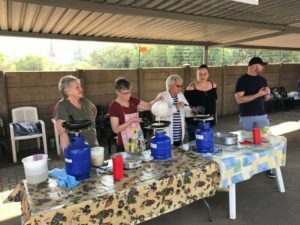 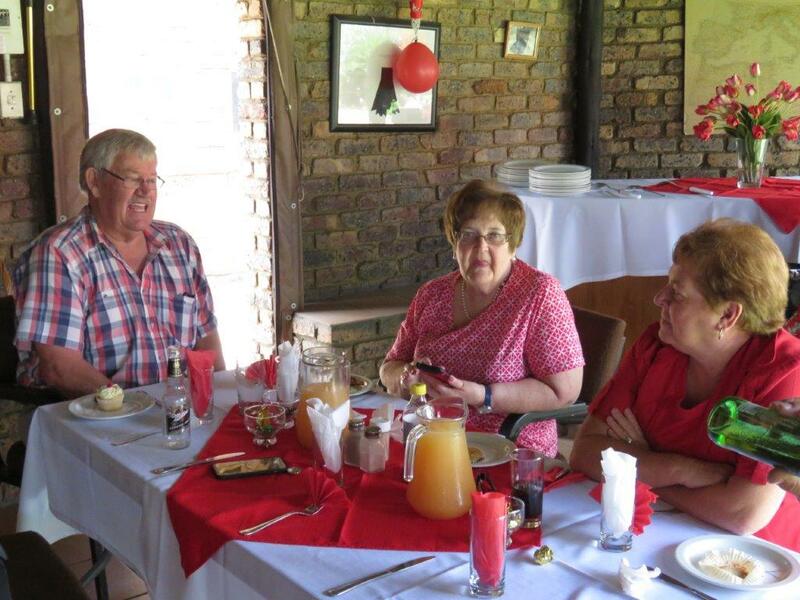 The meat was braaied under the watchful eye of Maritz Pretorius and Wollie Badenhorst while other residents enjoyed the wonderful sunshine and sipping all forms of liquid refreshments. 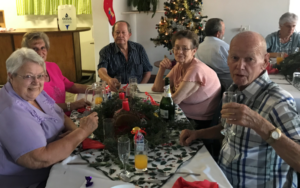 Once again all the residents, staff and committee members enjoyed the annual Christmas Party on Saturday 2 December in the lounge and dining room. 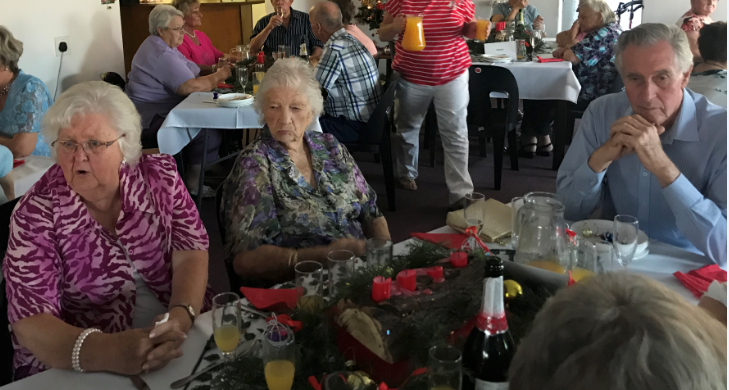 Bettie and the staff ensured that a spread ‘fit for a king’ was presented for the residents, champagne and other liquid refreshments flowed freely and everyone joined in dancing to the music provided by Chris Juaan. 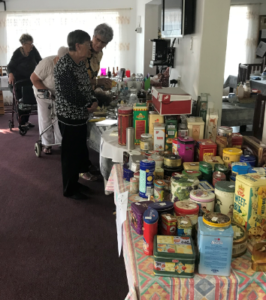 On Saturday 9 September 2017 the residents, staff and committee organised a Vintage Fair in order to raise funds for the complex. 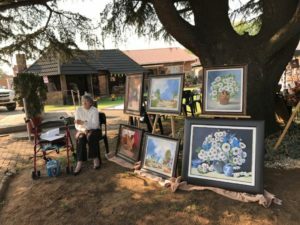 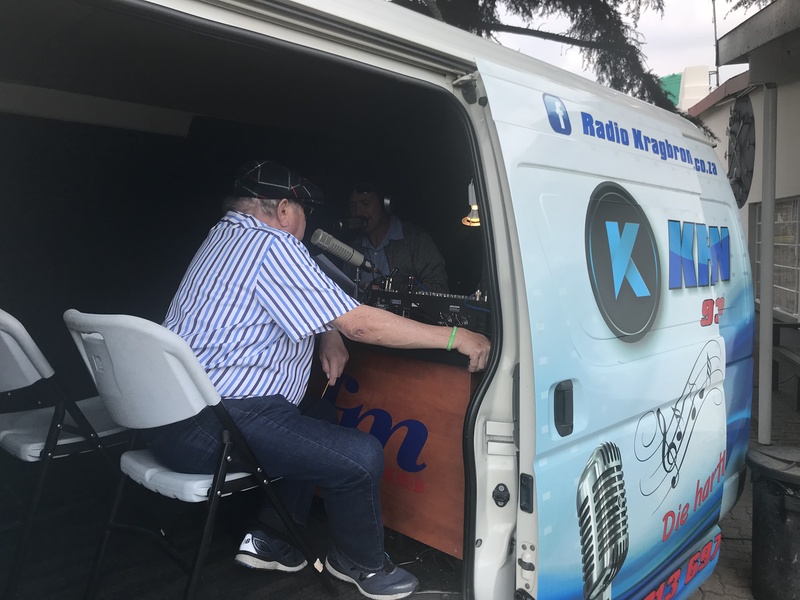 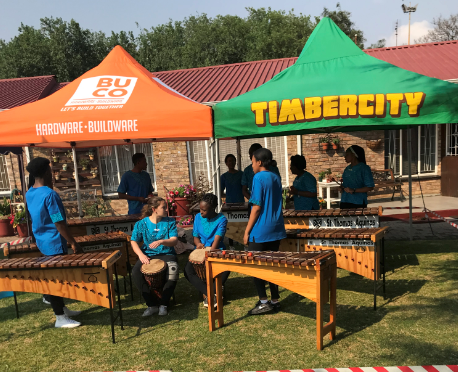 On the warm spring morning the Witbank Community streamed through the gates in response to the music, laughter and odours to discover what this fair was all about. The smell of freshly made pancakes, braaied meet and pap, jaffles, vetkoek and mince as well as curry and rice wafted through the air and the people queued up to sample these delights. Apart from the food stalls there were stalls for young and old such as homemade jams, pickles cakes and tarts there were stalls for needlework, books, plants and some excellent paintings by local artists and many others. For the children there was a fishing stall and jumping castle, young and old enjoyed the shooting range and darts. 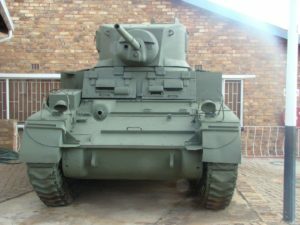 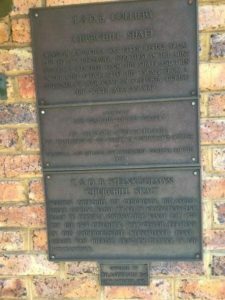 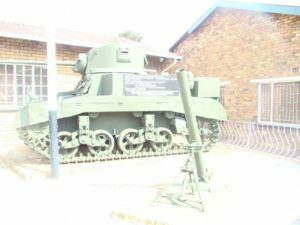 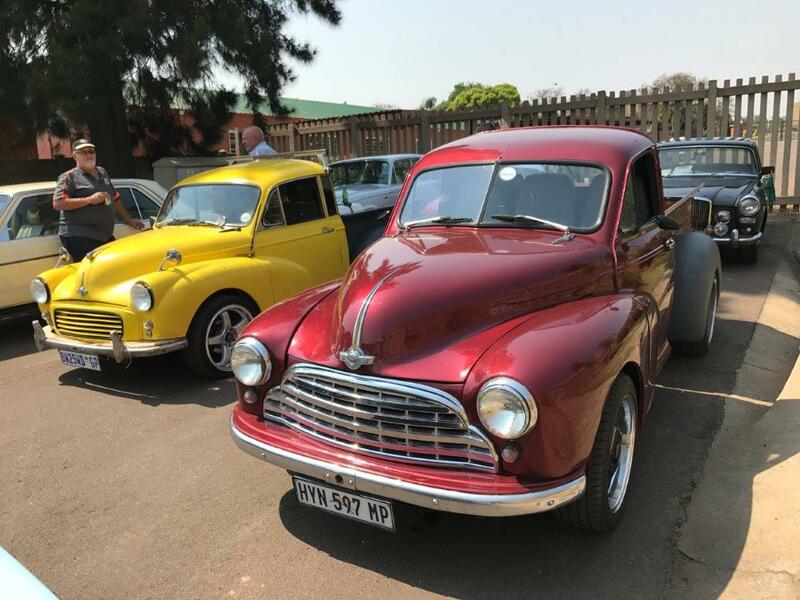 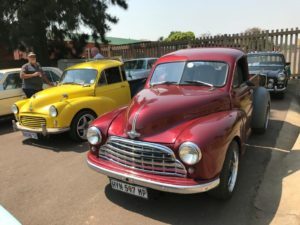 The Witbank Classic Car Club exhibited their classic cars to the delight of the visitors. 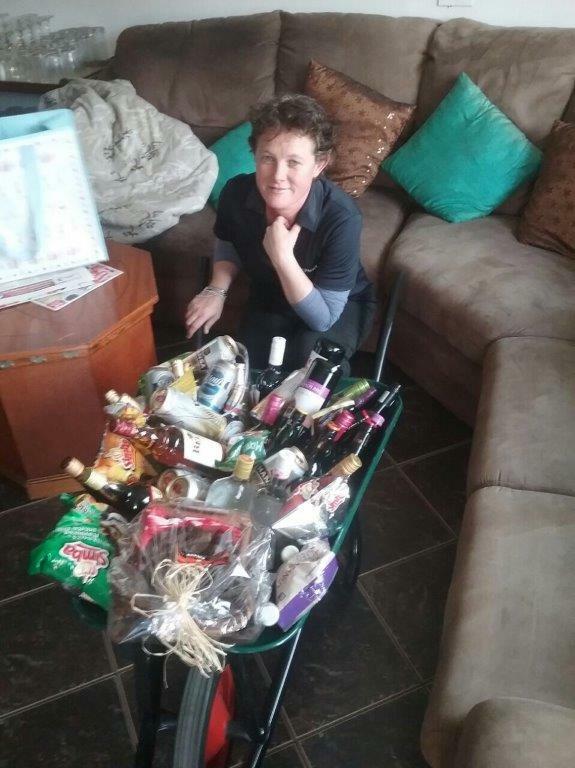 Very popular was the raffle of a wheelbarrow of liquor which attracted a large number of optimists hoping to stock their bars for Christmas. 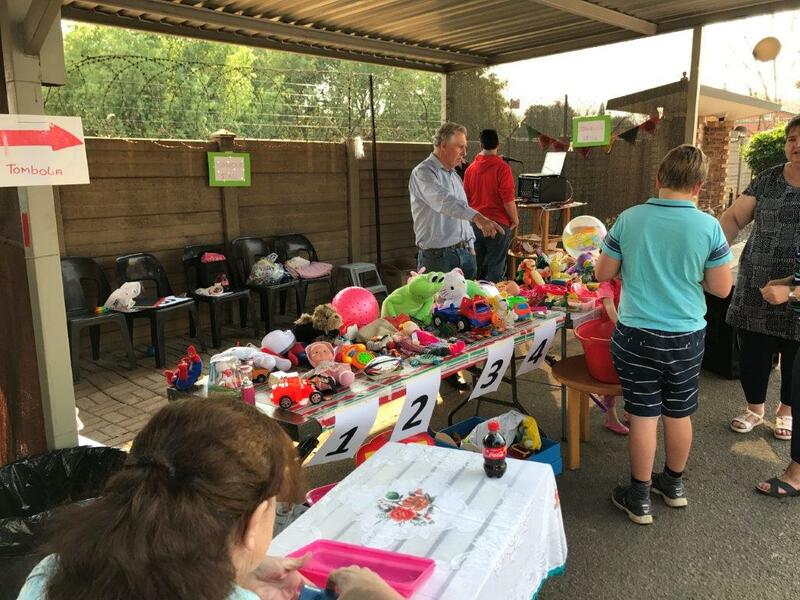 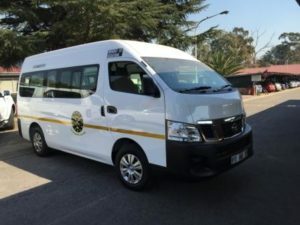 As the final members of the public drifted home at about 15:00 the organisers started to clean up and count the bounty, there was a gasp and a round of applause when it was announced that R55645.90 profit was raised on the day. 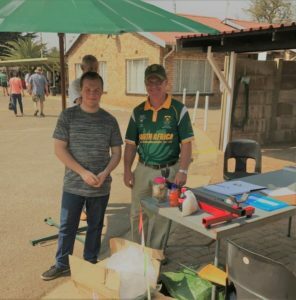 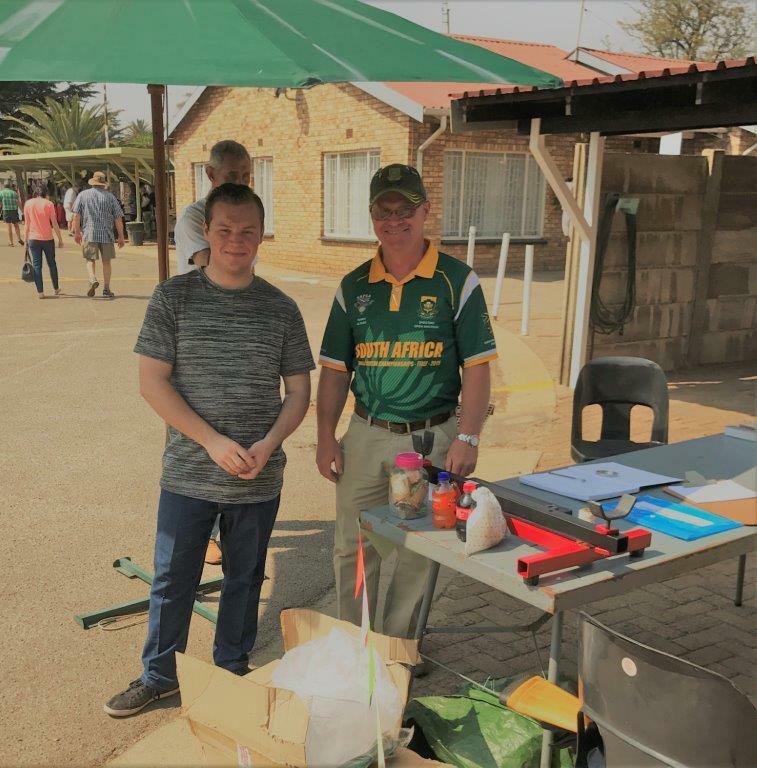 Tyron Glover (Mpumalanga School Colours for target shooting) with his father Tommy Glover who has represented South Africa in the World Tactical Shooying competition running the target shooting at the Moth Vintage Fair.